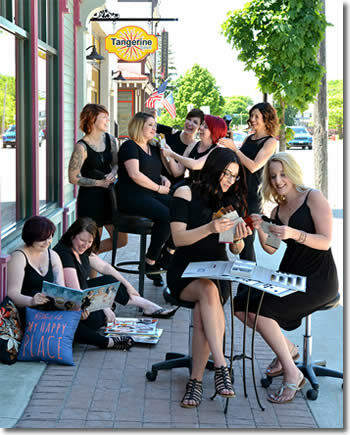 Invigorate Your Senses at Sheboygan's Tangerine Salon! A familiar voice, a welcoming smile and a genuine desire to accommodate our guests, awaits you when you enter our door. Our educated and dedicated professionals are passionate about showing kindness, creating comfort, and invigorating clients by exceeding their expectations. Tangerine Salon is committed to maintaining a modern, friendly environment, where each individual is always welcomed and gladly accepted for who they are. Whether you need a full day of beauty, a completely new hairstyle or a quick manicure, you'll find it here. Check out our services, invigorate your senses, and call us to make an appointment today! Our mission: A premier boutique salon that provides exceptional service through superior education. Our values: Open lines of communication, sharing, responsibility, respect, involvement, courtesy, unity and constructive spirit. Our motto: To Serve, Replenish, and Invigorate. Prices vary depending on stylist experience, achievement, and education. All services listed as starting prices. All services listed as starting prices. All prices are subject to change without notice. © 2009 - 2019 Tangerine Salon L.L.C. Sheboygan, Wisconsin. All Rights Reserved.